In the current cultural climate of going green, water is a valuable commodity. Many areas are experiencing drought conditions and local municipalities are restricting water usage much more often. In your pressure washing business, water is the key ingredient; without a good, reliable water source, you are unable to perform. But what are your options if potable (water suitable for drinking) supplies are limited, restricted or even prohibited? Can you use a different source like non potable water? You may be able to tap into another source for water by using non potable water, which, of course, is water that is not considered suitable for drinking but also is not considered contaminated. Non potable water may come in the form of natural sources such as streams, lakes, rivers or it may be available through your local water authority. You may also be able to tap into supplies of recycled water from your area’s wastewater treatment facility. The water, whether deemed non potable or recycled that your local facilities provide will need to adhere to their standards for labeling, usage and testing data. It may also require special transportation that indicates recycled water is being transported. Once you have investigated options for alternatives from non portable water to potable water sources, it’s time to consider your equipment. Pressure washing equipment has been designed to hand filtered water, not water from natural sources that may contain particles or water from local sources that may contain contaminants. When using a natural source to fill a trailer mounted pressure washer, you will want to employ a pump that is equipped with a large suction strainer to prevent the introduction of plant matter and other large particles into your pressure washer. Another, fine particle filter can be used to strain out small particles of dirt or sand. Care should be taken to evaluate all parts of the equipment to either assess their suitability for handling recycled water or to adjust their use so that you can take advantage of this resource. You may be using a continuous loop system, which recycles the non potable water at the jobsite and continues to use all water that can be collected during the pressure washing process. In this case, you will need to evaluate the pump your system uses to be sure that it can handle the change in water quality. Blockages can be common and strainer parts may need to be upgraded in order to handle the water. 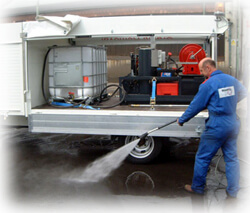 Pressure washer units, by definition, rely on water being forced through a nozzle, creating the pressure. If there are blockages, your equipment will not work to its best ability. Of course, there are instances where recycled water or non potable water would be contraindicated. In sanitary situations like kitchens or health environments like hospitals, only potable, filtered water should be used. In addition, you must clean all equipment in between using non-potable and potable water. Alternatives are not always the best, but with growing concerns over both water supply and quality, non-potable sources of water are worth investigating for your pressure washing business.